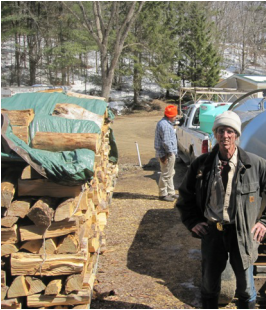 Here's Steve next to some of our supply of firewood and our sap collection tanks. Horner's Corner is a maple syrup operation, with apples and pears available in season. We're located about 8 miles north of Boyceville, WI, and have been making maple syrup (even when it was just in pans on a wood fire) for over 25 years. We have maple syrup available in a variety of sizes: 12 oz. in glass, pints in plastic or glass, quarts in glass and plastic, and our best deals, 1/2 gallons in glass or a gallon in plastic. Ask us about pricing. It varies if we're taking it to a farmer's market, are doing bulk sales or you are buying from us here at the farm. The work starts sometime in January, when Steve and his partners, Sam and Mike, start tapping the trees. The sap flows when the daytime temperature reaches above 32 degrees and nighttime temperatures fall below freezing. Around these parts, we expect the sap to start flowing sometime in early March. Typically, the season then runs about 4-5 weeks. Last year, we took 30,000 gallons of sap and turned it into maple syrup. You'll find you can use maple syrup for so many things other than pancakes and waffles. We use it in tea (both hot and iced), oatmeal, in cooking, in yogurt, in making candied nuts, cranberry sauce....there's so much you can do. Look back in the near future for more pictures and additional information about us and our farm!